A sample of compound can also be rotated as it moves across the Benz DIN Abrader drum, showing the effects of multidirectional abrasion. Manufacturers of products like tires, hose or gaskets, for example, can get a true reading of his compound when actually put to use. 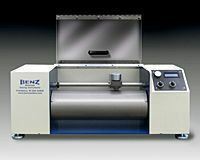 The Benz DIN Abrader itself measures only 76 cm long by 38 cm deep and 38 cm high (30" x 15" x 15") and is constructed in anodized aluminum and stainless steel with a plexiglass cover, allowing its operation to be visible. At the end of a testing cycle, which can be less than 40 m, The Benz DIN Abrader can auto-stop. Operation is simple and quick.